What a great find and how do you use them? And what did Waseca Bottling Company bottle? 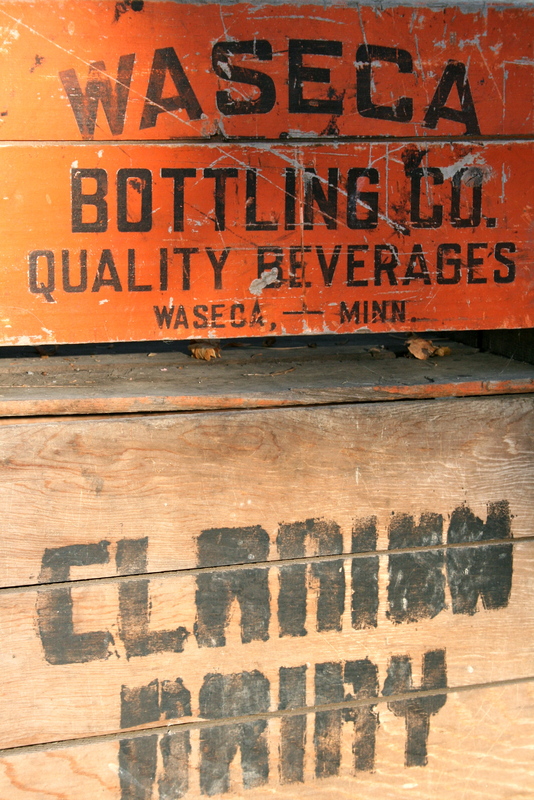 The Waseca bottling Co. dates to before the turn of the century. It was started by Billy Baldwin, and later sold to WJ Armstrong. The bottling company was located in the Armstrong Wholesale Grocery Store. This building was bought and restored and now houses a great bar and two restaurants. Also rooms are available to rent in this beautiful historic building. I believe it was a cola that they sold. I first saw one of these crates at a friends house when we moved here–of coarse I had to have one, well 5 is what I wanted! One for each kid to keep if they wanted. I find them at auctions and antique shops…but I’m a cheapskate so I wait for a deal. I still need one more! We will have to have lunch at the Armstrong building some time! And I use the crates for tons of things, they multi purpose well. Ever since all those design magazines started using vintage crates in their shoots, the prices have skyrocketed around here…Wish I had picked up a few more when they were still cheap. My son-in-law collects Moxie stuff. He has enough of those crates to make display shelves.